Changing the way your therapists deliver customer service at your spa through training is no easy task. It is not for the weak or faint-hearted. Game of Thrones demonstrates the importance of having a strategic plan which will assist you in reaching your ultimate goal. Even then you may encounter unexpected resistance or roadblocks, but you'll be better prepared to meet them head-on. Remember when Jaime Lannister pushed young Bran Stark out of the window in Season One? It was shocking! After we began breathing again, we knew that we were hooked. That's what the right training program should do, stimulate interest from the start. It should never be boring, but should leave your team craving more. Viserys Targaryen, the brother of Daenerys, "Mother of Dragons" mistakenly assumed that as senior sibling, the crown was his birthright. When Khal Drogo poured molten gold on his head he discovered that was not the case. Senior therapists may be comfortable feeling entitled to behave in a way that's non-productive and doesn't serve to elevate your brand. They may even discourage the enthusiasm of newer team members. Make it clear to them that stellar customer service and sales performance will trump seniority every time. When Daenerys willingly entered the funeral pyre of Khal Drogo, she knew that she was all powerful. However your therapists probably don't come close to that level of self confidence. Most therapists are introverts and their discomfort with selling retail may even be palpable. But as their manager you should know their potential. Be ruthless about ensuring their success. Because once they complete spa training, and see what they've accomplished, magic will happen. They'll emerge from the fire like Daenerys with baby dragons of confidence, better listening skills, and heightened empathy. Jon Snow successfully rallies the Wildling's leaders with minimal resistance. But when his army is later attacked by the nightmarish White Walkers, only his weapon of Dragon Glass is effective in killing them. Luckily he has Wun Wun the giant, who alternately flings them aside or squashes them into the ground. Spa therapists are often divided into cliques. If a clique leader is resistant to training, their entourage may refuse as well. Don't hesitate to seek verbal or written support from your Wun Wun, aka senior management to help your team more quickly understand the necessity of change. The "Breaker of Chains" and "Mother of Dragons", has always kept a trusted confidante close by. Daenerys understands the importance of having a touchstone. 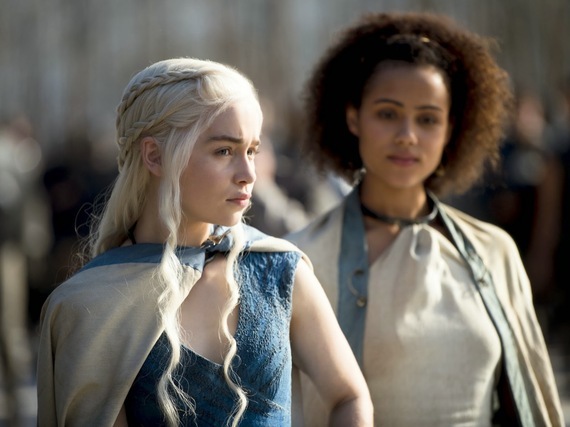 Whether it's her lady-in-waiting, Missandei, or her intellectual superior Tyrion Lannister, she believes in establishing relationships and the power of comprehensive listening. During your training classes there will be a lot of interaction with everyone learning at their own pace. You'll want to ask an assistant manager or colleague that your team trusts to help monitor their progress and report back to you. This will enable you to more accurately assess the effectiveness of the training while providing encouragement to your team. Game of Thrones shows us that the road to success may be rife with drama but in the end for your customers, brand and team, it will be worth the journey.